The idea for this recipe came after successful day fishing at Prineville (Oregon) Reservoir. I borrowed some ideas from different sources, tweaked ingredients and the concoction became a family favorite. The recipe was entered in the summer, 2001 “Crappie World” magazine recipe contest, and won first prize. This recipe is great for virtually any kind of fish, and is particularly good in a situation where you don’t have a lot of fish and need to stretch the quantity of the food. While I fully support and follow catch-and-release philosophies on many species of fish, some species need to be harvested to maintain a healthy population. Always follow local laws, of course, but there are many species of panfish you can harvest, eat and enjoy without guilt. Crappie are available virtually everywhere. I’ve caught them through the ice, or with a cane pole and crickets on blistering hot Mississippi afternoons. My favorite crappie rig, is a six-to-seven foot spinning rod, with a small to medium spinning reel. Four-to-six pound line, depending on the conditions, should be about right. Obviously, variations of color and jig head size abound, but I start out with this combination and usually don’t have to do much switching to get into the fish. 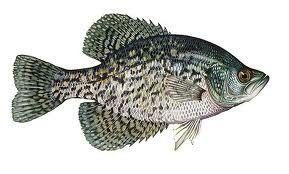 The flesh of a crappie is firm and delectable and is a favorite for fish fries. But sometimes, you want some variety, and that’s where this chowder recipes comes in. Substitute canned milk for fresh and Half-and-Half, and you can make this recipe on a river bank or in a fishing camp. You could even substitute dehydrated onions, potatoes and corn, and canned butter and make this recipe entirely out of storage foods and fresh fish fillets. Melt butter in a skillet over medium-high heat. Add onion and sauté until translucent, about four minutes. Remove onions from skillet. Pan-sear crappie fillets for about one minute on each side. Remove fillets from skillet, and cut into small squares. Add potatoes and onions and cook, stirring frequently for about five minutes or until they begin to soften. Stir in enough cold water to cover potatoes, cover, bring to a boil, add Old Bay seasoning and cook for about 10 minutes. Add fish to potatoes and cook seven minutes on a slow boil. Add milk and Half-and-Half, stir and heat until very hot, but do not allow it to boil. Season with salt and pepper. Related: Should you remove the snow off your roof?